As the kidneys gradually lose their ability to regulate and remove waste products effectively, these waste products build up in the blood. This is called uraemia and can make a cat feel very unwell. Generally speaking, cats with creatinine over 3 mg/dl (US) or 265 µmol/L (international), will have problems with uraemia. Controlling the CKD should help your cat feel a lot better. One of the main roles of the kidneys is filtering the blood to regulate and remove waste products or toxins. Kidneys damaged by CKD gradually lose their ability to do this properly, so these waste products build up in the blood: this is called azotaemia. This can make a cat feel very unwell, and the clinical signs and symptoms that azotaemia causes are collectively known as uraemia. The uraemic toxins which the cat's damaged kidneys are unable to filter properly include parathyroid hormone. Contrary to popular opinion, BUN and creatinine are not toxins themselves. However, BUN levels correlate with uraemic toxin levels, i.e. if BUN is elevated, it is highly likely that uraemic toxins (which are less easy to measure) are also elevated. Generally speaking, you will probably start seeing signs of uraemia in cats with creatinine over 3 mg/dl (US) or 265 µmol/L (international) who are properly hydrated. University of Georgia College of Veterinary Medicine has some information about uraemia. ISFM consensus guidelines on the diagnosis and management of feline chronic kidney disease (2016) Sparkes AH, Caney S, Chalhoub S, Elliott J, Finch N, Gajanayake I, Langston C, Lefebvre H, White J & Quimby J Journal of Feline Medicine & Surgery 18 pp219-239 state "Cats with CKD suffer from nausea, vomiting and inappetence as a result of uraemic toxins affecting the central chemoreceptor trigger zone." Some of these symptoms may also be seen in other manifestations of uraemia, as discussed below. Neurological symptoms are sometimes seen in CKD cats, particularly as the CKD progresses and the uraemia worsens. Renal Disease (2006) Polzin DJ Delaware Valley Academy of Veterinary Medicine says "Metabolic encephalopathies and peripheral neuropathies may occur in dogs and cats with uremia. It is reported that as many as 65% of dogs and cats with primary renal insufficiency/failure have neurological manifestations. Of dogs with neurological signs, altered consciousness (31% of patients) and seizures (29% of patients) were the most common signs. In our experience, acute onset of altered mentation is an important neurological finding in dogs and cats with CKD that typically heralds a poor short-term prognosis. Other common signs include limb weakness, ataxia and tremors." This may be caused by the toxin levels. Renal Disease (2006) Polzin DJ Delaware Valley Academy of Veterinary Medicine states "Patients may develop what has been described as the "twitch-convulsive" state wherein there is the simultaneous combination of tremor, myoclonus, and seizures. In advanced CKD, patients may have neurologic signs that are cyclical and episodic, varying from day to day. The severity and rate of progression of neurological signs appears to vary directly with the rapidity with which CKD develops." If the twitching is in the limbs, it may be termed peripheral neuropathy. Occasionally, if toxin levels are really high (and particularly if a cat is in The Final Hours), a CKD cat may have seizures. In such cases, reducing toxin levels is essential in order to avoid permanent damage to the brain; but this may not be possible if the cat is in his/her final hours. Seizures may take a number of different forms. There may be the classic jerking and loss of consciousness, but being "spaced out" or mentally absent or staring into space may also be a type of seizure. Harpsie's website has more information on what seizures may look like. metoclopramide (Reglan) for stomach problems or Advantage for fleas may lower the seizure threshold. Other possible causes of seizures include epilepsy or a brain tumour, but the causes mentioned above are far more likely in a CKD cat and should therefore be considered first. Audiogenic reflex seizures in cats (2016) Lowrie M, Bessant C, Harvey RJ, Sparkes A & Garosi L Journal of Feline Medicine & Surgery 18(4) pp328-336 reports on a particular kind of epilepsy called feline audiogenic reflex seizures (FARS) which was recently identified in cats. This is most often found in elderly (over 15) or Birman cats, and is triggered by high-pitched noises, such as crinkling a paper bag or touching keyboard keys. International Cat Care explains more about this condition. Although phenobarbital is usually used for epilepsy in cats, Levetiracetam in the management of feline audiogenic reflex seizures: a randomised, controlled, open-label study (2017) Lowrie M, Thomson S, Bessant C, Sparkes A, Harvey RJ & Garosi L Journal of Feline Medicine & Surgery 19(2) pp200-206 found that a different medication called levetiracetam (Keppra) seems to work better for this condition. Seizures can be very scary to watch, but they are not thought to be painful and often the cat does not even know it is happening. Cats may be confused for a short while afterwards, but usually recover quickly. Many cats have an increased appetite following a seizure so make the most of this if your cat is a typical fussy CKD eater. This is sometimes the result of toxin levels in the blood. steroids can make a cat become vocal. I would recommend always having blood pressure checked in a howling cat. Increased vocalisation in elderly cats (2015) Gunn-Moore DA European Journal of Companion Animal Practice 25(3) pp20-29 states "Chronic kidney disease can result in increased vocalisation when associated systemic hypertension causes cerebral vascular compromise (as in CDS). It can also occur when polyuria without adequate access to water cause cerebral dehydration, when polydipsia/polyuria predisposes to a secondary UTI (see UTI), or when severe uraemia results in uraemic encephalopathy." If the uraemia is particularly bad, the cat may develop gastrointestinal bleeding. Nutritional management of chronic renal disease Fascetti AJ & Delaney S University of California at Davis says "The waste products may also enhance blood loss by leading to the formation of gastrointestinal ulcers and a reduction in blood clotting ability." Unfortunately this is often not easily detectable, though it may sometimes manifest itself as diarrhoea. Renal Disease (2006) Polzin DJ Delaware Valley Academy of Veterinary Medicine says "Uremic enterocolitis, manifested as diarrhea, may occur in dogs and cats with severe uremia ...when present, uremic enterocolitis is often hemorrhagic. Considerable gastrointestinal hemorrhage may initially escape clinical detection." Dark stools are also a possible sign, as is vomiting blood. Occasionally, however, dark stools are caused by iron supplements. If you suspect gastrointestinal bleeding, you should take a stool sample to your vet for occult blood testing (when I did this for Ollie, I was the first client who had ever requested this test; but it was positive). See Diagnosis for more on how to test for gastrointestinal bleeding. CKD cats with this problem do not normally need to be treated in hospital. If gastrointestinal bleeding remains untreated, anaemia may result. Pet Place has some information about blood in stool (melena). Although uncommon, diarrhoea may sometimes be seen in CKD cats secondary to the CKD. Renal Disease (2006) Polzin DJ Delaware Valley Academy of Veterinary Medicine says "Uremic enterocolitis, manifested as diarrhea, may occur in dogs and cats with severe uremia, but it is typically less dramatic and less common than uremic gastritis. Owners of 80 cats with spontaneous CKD did not report diarrhea. However, when present, uremic enterocolitis is often hemorrhagic. Considerable gastrointestinal hemorrhage may initially escape clinical detection." a sudden change of food, perhaps to a therapeutic kidney diet. It is better for a cat's digestive system if a new food is introduced gradually - mix some of the new food with the old and gradually increase the amount of the new food in the mix over a period of several days. food intolerance. Because the goal is to reduce protein levels, some CKD therapeuti foods may have relatively high levels of carbohydrates, and some cats who are used to a higher protein diet may find these harder to process. Introducing the new food gradually may help, but some cats are simply grain-intolerant. cats taking antibiotics may develop diarrhoea. Pet MD discusses this. If you think this might be the cause, contact your vet and ask if you can switch to a different antibiotic. Please do not just stop the antibiotic, however, or the infection may return with a vengeance. too much lactulose or MiraLAX, given to treat constipation, may cause the opposite problem of diarrhoea. It is better to start lactulose at a low level and increase as necessary. sometimes people think their cat has really runny diarrhoea, but in actual fact, the cat is constipated and the runny liquid is all that can squeeze out round the solid stool. This is known as "overflow incontinence". So do be aware of this possibility, particularly if there is only a small amount of liquid faeces. potassium supplements may cause diarrhoea, as mentioned by both Pet Education and Drs Foster and Smith. nephrotic syndrome, though this is actually relatively rare in cats. inflammatory bowel disease (IBD) may cause diarrhoea. hyperthyroidism may also cause diarrhoea in some cats. malabsorption problems and parasites are other possible causes. Whatever the cause, you must see your vet if the diarrhoea lasts longer than a day or so, both to ensure your cat is OK (diarrhoea may cause or worsen dehydration) and for a proper diagnosis. International Cat Care discusses diarrhoea. Cornell University College of Veterinary Medicine discusses diarrhoea. Idexx Laboratories offer tests for cases of diarrhoea where a pathogen is thought to be involved. Diagnostic and therapeutic approach to cats with chronic diarrhea (2001), Marks S Presentation to the World Small Animal Veterinary Association 2001 World Congress discusses how to determine the most likely cause of diarrhoea. Washington State University College of Veterinary Medicine discusses the causes of diarrhoea in dogs and cats. Newman Veterinary discusses causes of diarrhoea. I am sometimes asked about stool colour and texture. Sometimes I am even sent unsolicited photos of said stools. Ah, the joys of running this site. Pale stools may indicate a lack of bile, which is sometimes a sign of liver disease. Green stools may indicate rapid transit through the small bowel. Here are some links on the different colours, sizes and textures of cat poop. I uploaded these just after eating a rather gooey chocolate brownie. Bad move. Bristol stool form scale for humans but hey, poop is poop. The high levels of urea seen in CKD cats are released into saliva. An enzyme in the bacteria in the mouth called urease interacts with the urea and produces a very strong and distinctive odour. It is hard to describe the aroma, though once smelled, never forgotten. It is sometimes described as being an ammonia smell (like bleach) but it may smell more like urine (ammonia is a constituent of urine), though neither description really captures the smell. This smell will often be particularly noticeable if the cat crashes. If your cat's breath smells more like nail polish remover, this may indicate diabetes. The toxins produced by the body can cause ulceration of the gums, which occurs when the uraemic waste is converted by the bacteria in the mouth into ammonia (hence the smell of the cat's breath being described as ammonia-like above). You may see ulcers in the cat's mouth if you look inside, or in severe cases your cat may vomit blood (which may also be a sign of bleeding from further down the gastrointestinal tract). You may also see drooling. Some cats paw at the mouth (which can also be a sign of dental problems). Mouth ulcers are very painful and often lead to a lack of appetite, or, even more distressingly, a desire to eat coupled with an inability to do so - the cat may approach the food bowl and sniff the food, then walk away. Mouth ulcers may also be a sign of metabolic acidosis. Check inside your cat's mouth regularly for inflamed gums or ulceration or ask your vet to do so. I am sometimes asked what mouth ulcers look like. They are usually a small area of white or yellow, sore-looking skin with a thin red ring around it. Long Beach Animal Hospital has a photo of mouth ulcers in a CKD cat. Animal Dentistry and Oral Surgery Specialists also have some photos. 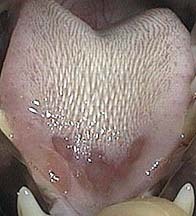 Feline and canine oral ulcerative disease (2014) Niemiec BA Today's Veterinary Practice Jan/Feb 2014 discusses other possible causes of ulcers. Cats who grind their teeth may have excess stomach acid. Dental problems are another possible cause. It may also be a sign of dehydration. This sign is sometimes seen in cats with pancreatitis. Very occasionally, this might be a sign of "rubber jaw", caused by a condition related to the CKD called secondary hyperparathyroidism. Animal Dentistry and Oral Surgery Specialists discuss the various causes of teeth grinding in cats. Drooling cats may have excess stomach acid. Dental problems or mouth ulcers may also cause drooling. In some cases drooling may be a side effect of using maropitant (Cerenia). The Pet Health Network has more information about drooling. Pet MD also has some information. The most common reason for this is dental problems. Occasionally it is a sign of mouth ulcers. In rare cases this may be a sign of a rare condition called Feline Orofacial Pain Syndrome (FOPS), which is a pain disorder predominantly seen in Burmese cats. Feline orofacial pain (FOPS) (2009) Rusbridge C has some information about this condition. Some CKD cats have a distinctive aroma, which is caused by the levels of toxins in the body. It is similar to the bad breath aroma. You may notice an increase in this aroma or it may develop for the first time if your cat's bloodwork is worsening. In some cases, you may first notice this smell when your cat crashes. Thomas developed this smell seemingly overnight when he crashed, but after treatment it gradually disappeared. This may be a uraemic itch caused by the levels of toxins in the blood. Pruritus in certain internal diseases (2007) Yonnova D Hippokratia 11(2) pp67-71 mentions that itching occurs in about 15% of uraemic human patients, so if your cat is scratching a lot or grooming excessively, consider this possibility. occasionally liver problems; if this is the case, your cat's bloodwork should show elevated liver values. If your cat actually pulls out fur rather than merely scratching, this may indicate hyperthyroidism. Itching, particularly on the face, may also be a side effect of the medication used to treat hyperthyroidism. It has long been known that hypothermia (a reduced body temperature) may be seen in human CKD patients, which occurs in part because the kidneys produce more than 10% of body heat. Hypothermia in uremic dogs and cats (2016) Kabatchnik E, Langston C, Olsen B & Lamb KE Journal of Veterinary Internal Medicine 30(5) pp1648-1654 looked at the records over sixteen years of cats who underwent haemodialysis in NYC and found that 38% of the cats with elevated kidney values had hypothermia. It concludes "In cats, UH seems to be a more prevalent phenomenon driven by uremia." Hypothermia is also often seen in anaemic cats. See Anaemia for tips on keeping your cat warm. It is possible to treat all of the above symptoms, in many cases effectively, and details can be found in the Treatments section.